* A clear grammar focus, so students always know what they are expected to learn. * Characters are illustrated in a sophisticated style of drawing and photographs. * Songs and chants, used to introduce new language, are in an upbeat, 'pop' style. * Photos and information give a window on life in English-speaking cultures. * Regular reviews and tests. 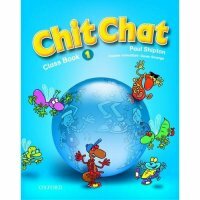 * Chit Chat can be used with children starting to learn English, or those who have already been introduced to listening and speaking in English.